While in Japan I took up the sport of basketball. This probably seemed like an unprecedented move as I have never been particularly co-ordinated nor interested in team sports. In the interest of making a long story short, let's just say "I did it for a guy." 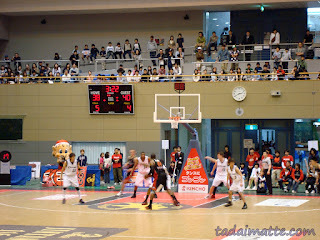 However, that did mean that my first pro basketball games were all watched in Japan, long before I ever saw an NBA game. The unfortunately-named "bj league" (Basketball Japan League) is the top flight of basketball in the country. It was founded in 2005 and now boasts 19 teams with the hopes of expanding to 24 teams in the next few years. 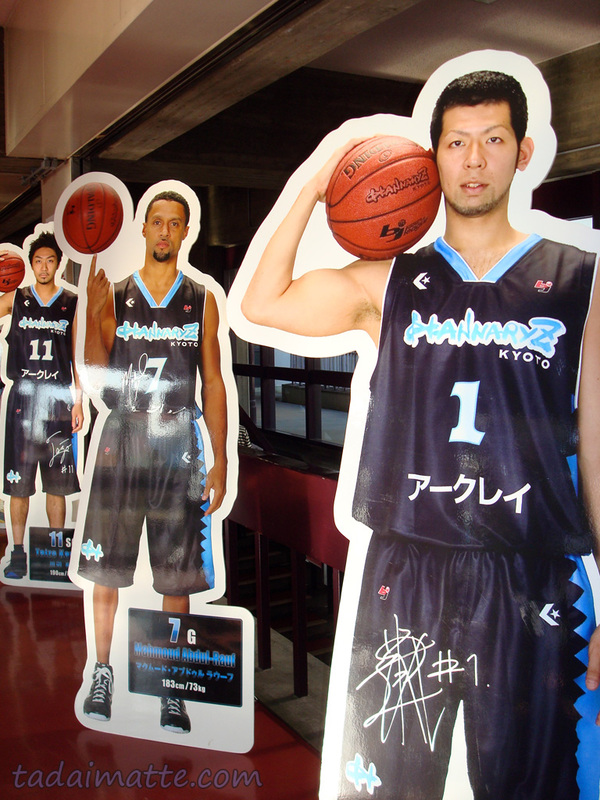 Like many foreign leagues, the bj league has few familiar names - retired NBA players or college basketball stars - but few noteworthy enough to be recognizable to a person new to the sport. The best I can offer is that I saw Mahmoud Abdul-Rauf, formerly of the Vancouver Grizzlies, Denver Nuggets and Sacramento Kings, feature as a star player in Japan. I went to my first game alone. It was at a tiny arena in a part of Kyoto that I'd never been, and the Kyoto Hannaryz were playing the Ryukyu Golden Kings. The Hannaryz were an expansion team in their first season; the Golden Kings last year's league champions. Needless to say, this was a bit of a massacre. The Hannaryz were obviously struggling for fans as well - I bought a ticket for $15 in the non-reserved balcony seats, and was less than 3 feet behind the home team seating, for three times the price. It was cold in the gym and not terribly well-lit, and not much fanfare compared to my later experience with NBA games. However, you can't buy tea and boxes of takoyaki (fried dough balls containing octopus) at NBA games, so the bj league wins. During the game I witnessed the phenomenon known as Japanese sports cheering. Each time Kyoto had the ball and were driving, the crowd (led by the emcee) would perfectly chorus, "Go! Kyoto! Hannaryz!" *clap clap* "Go! Kyoto! Hannaryz!" *clap clap* It was kind of amazing. 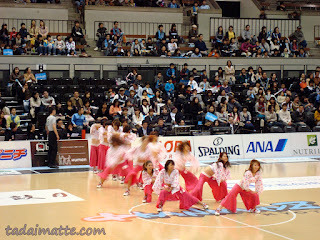 When Okinawa had the ball, the crowd would go "Defense! Defense!" *clap clap* It was similar to chants you might hear in North America, but so very scripted, hehe. By the end of the game I was in love with the obviously-underdog Hannaryz, particularly Reda Rhalimi, one of their bigs. Actually, I liked both bigs, and John Clifford gave me a high-five as he left the gym. All in all it was a great time; loved the players, the game, the cheerleaders (wearing zori sandals and bell sleeves! Really!) the food, even the Golden Kings. Kyoto won the rematch game the following night. I do wish I'd gone earlier in the year so that I could have seen more of Kyoto's first season. I saw a second game a few weeks later, the Osaka Evessa versus the Oita Heat Devils, and what a stark contrast from the Hannaryz game! The gym in Ikeda was bright, sweltering and loud. Every person in the stands had these huge paper fans that them would use to hit their legs and the bleachers. There also seemed to be more cheerleading, but with less clothes. At the half, the concessions area was jammed with people buying coffee and ice cream, and Evessa swag from like 5 tables. The cheerleaders had their own picture book. The Evessa (top of the conference, also in contrast) were a solid team who fouled every player they touched (racking up nearly a dozen fouls in the first quarter alone) and I have to admit I didn't really come to like any of their players in particular. One of the good things about this game though was the big push by the Evessa at the end, they came from being down a dozen or so points to being tied...one guy blew a free throw that would have put them in the lead. ...in the end, though, I came away from the game not really impressed with the Evessa and kinda wishing I could have seen another Hannaryz match instead. Glad I could see both while I was still there, though. The Hannaryz are in the conference finals this year, so they've come a long way! Wish I could see them now. Japanese basketball is definitely an experience...I like thinking that I learned many of the terms in Japanese before I even knew them in English. Go! Kyoto! Hannaryz! Go Kyoto Hannaryz! Glad you enjoyed the game.